Built in 1805, Bowcliffe Hall is set in twenty eight acres of spectacular grounds, superbly located just 5 minutes drive from the A1M, four miles South of Wetherby. 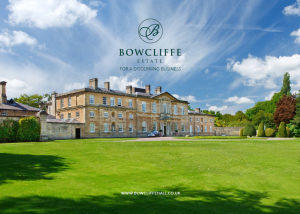 In addition to our serviced offices, the Bowcliffe Estate offers period and contemporary unserviced offices with all the amenities one would expect of a modern office and meeting venue. Many original buildings around the Estate have been sympathetically converted into premium office space, many with original features. A recent multi phase development saw the creation of the award winning, inspirational Blackburn Wing, an airplane wing shaped meeting and events venue, built in protected woodland on the Estate.